Strabo (64 BC – 24 AD) was a Greek historian, geographer and philosopher. And Macedonia, of course, is a part of Greece. According to Strabo the Tyrians paid particular attention to the sciences of numbers, navigation, and astronomy; they had, we know, considerable commerce with their neighbours and kinsmen the Chaldaeans. Strabo, traveling in North Africa ... [did not find] its women in the army but found that they ruled the country politically, while the men were still without significance in the state, occupying themselves largely with body care and hair-do, greedy for golden jewelry with which to bedeck themselves. The Berbers of our times ....[,] [n]ear the Atlas Mountains, ... have preserved a strong gynocracy. In some Tuareg tribes, the women perpetuate the old culture and know Old Libyan writing and literature. Their men wear veils and remain illiterates. Helen Diner Mothers and Amazons (trans. 1965 (original 1930s)), p. 137. 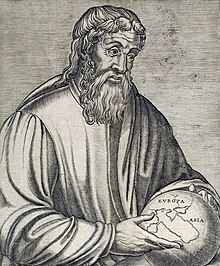 Strabo,... enters largely, in the Second Book of his Geography, into the opinions of Eratosthenes and other Greeks on one of the most difficult problems in geology, viz., by what causes marine shells came to be plentifully buried in the earth at such great elevations and distances from the sea. He notices, amongst others, the explanation of Xanthus the Lyclian, who said that the seas had once been more extensive, and that they had afterwards been partially dried up, as in his own time many lakes, rivers, and wells in Asia had failed during a season of drought. Treating this conjecture with merited disregard, Strabo passes on to the hypothesis of Strato, the natural philosopher, who had observed that the quantity of mud brought down by rivers into the Euxine was so great, that its bed must be gradually raised, while the rivers still continued to pour in an undiminished quantity of water. He therefore conceived that, originally, when the Euxine was an inland sea, its level had by this means become so much elevated that it burst its barrier near Byzantium, and formed a communication with the Propontis, and this partial drainage had already, he supposed, converted the left side into marshy ground, and that, at last, the whole would be choked up with soil. So, it was argued, the Mediterranean had once opened a passage for itself by the Columns of Hercules into the Atlantic, and perhaps the abundance of sea-shells in Africa, near the Temple of Jupiter Ammon, might also be the deposit of some former inland sea, which had at length forced a passage and escaped. We learn from a passage in Strabo, that it was a dogma of the Gaulish Druids that the universe was immortal, but destined to survive catastrophes both of fire and water. That this doctrine was communicated to them from the East, with much of their learning, cannot be doubted. This page was last edited on 26 December 2016, at 15:33.